I’m pretty cynical when it comes to reading blogs or scrolling through social media. I see a post where a brand is featured and I automatically assume it is sponsored content. While this isn’t a revenue stream for my business, I don’t fault anyone for utilizing it. If it works for your brand, more power to you. 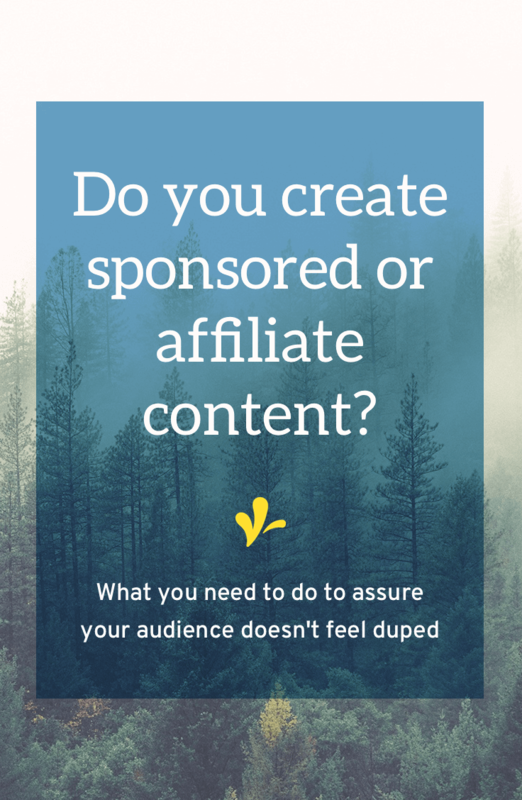 But if you are utilizing this revenue stream you have a legal and ethical responsibility to let your audience know that the content is sponsored. It’s your job to make it very clear to visitors if you are being compensated for that bonus, link, or post. The FTC has created the rules that you need to follow to make it clear that this content is sponsored. And these rules are pretty common sense when you think about them from the consumer’s standpoint. You are just trying to make it clear to your audience that you are getting a kickback in exchange for your review, comment, post, or link. Action: You can’t require visitors to take extra steps to read the disclosure (e.g. no click-through links). 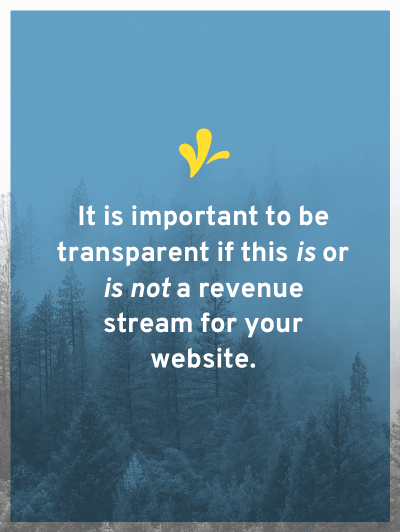 Clear: Visitors must easily know that you are getting paid in exchange for website placement. Timing: You can’t just tell visitors once. Disclosures must be on every post, social media interaction, link, or comment. You make a PACT with your audience to be transparent about your income-generating relationships. How do you keep your PACT? One simple solution is adding the text [affiliate link] after any text or image link. Or having a standard blurb that goes at the top of each sponsored blog post. This post was made possible by a sponsorship from [BRAND NAME (with link to brand)]. But, all opinions and reviews are my own and this product/service wouldn’t be featured if I didn’t think it could help you. A good example of this is the blurb that Victoria at sfgirlbybay uses. This post might contain sponsored/affiliate links. Click here to learn more. So, I get it, right now the FTC isn’t going after your average blogger for failing to include this information in sponsored content. But that doesn’t mean that you shouldn’t do this. You should comply because you don’t want your audience to feel duped. You don’t want someone in your audience to lose respect for you and stop following you because they later learn that you promoted something because you were getting paid to do so. Most people don’t care that you are generating money from this content, but they do care if they feel like you duped them. 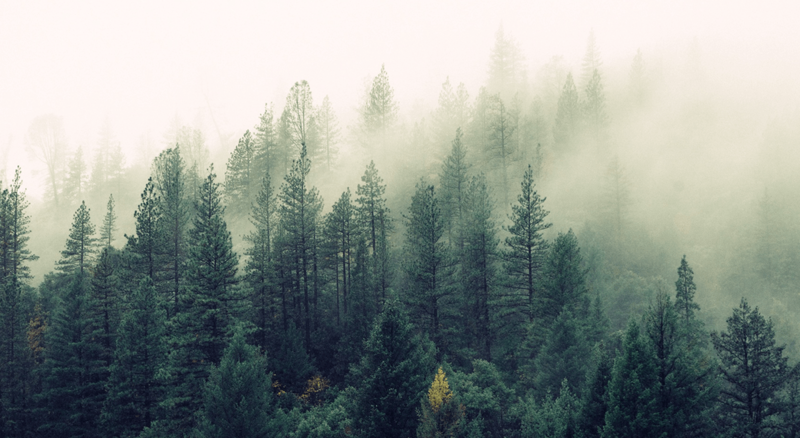 Are you keeping your PACT with your visitors? Share how below or how you plan on improving.